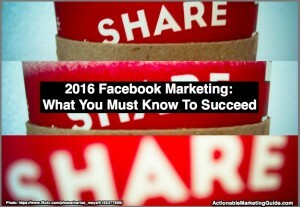 Your 2016 Facebook marketing strategy is vital to your business success. Facebook continues to be the social media giant that can’t be ignored by marketers regardless of location or type. Its 4Q2015 earnings report confirm this. The social media platform continues to exceed financial performance expectations. Marketers pay special attention to these numbers because they translate to higher 2016 Facebook marketing costs. Facebook’s full year 2015 revenue was $17.93 billion, up 44% year-over-year. 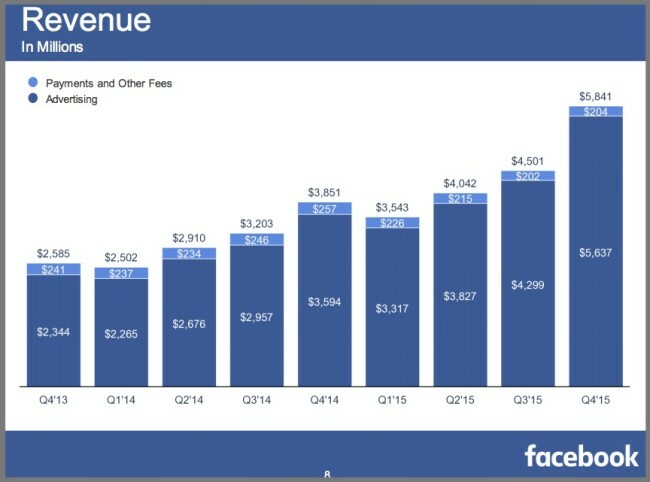 4Q2015 Facebook revenues increased to $5.84 billion, up 52% year-over-year. 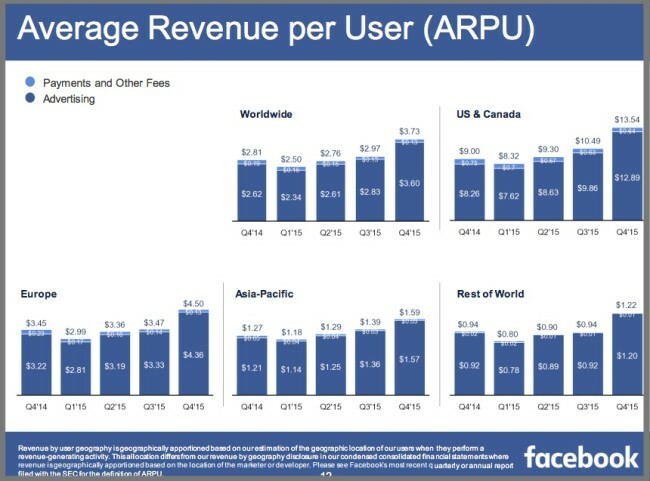 Facebook generated an average of $3.73 in total revenues per user in 4Q2015, up 33% from $2.62 in 4Q2015. Facebook’s revenues are skewed in terms of source and geographic location. The lion’s share of Facebook’s revenues are from advertising. The US and Canada yielded an average of $13.54 per user in 4Q2015, up 50% from $9.00 in 4Q2014. By contrast, Asia Pacific yielded an average of $1.59 per user in 4Q2015, up 25% from $1.27 in 4Q2014. While these results are strong, the inherent problem is that the US is still driving revenues despite expanded users globally. Increasing users outside of the US doesn’t and won’t increase the bottom line. Based on members, Facebook continues to dominate the social media playing field. As a marketer you must be present to capture some portion of your target audience’s attention. 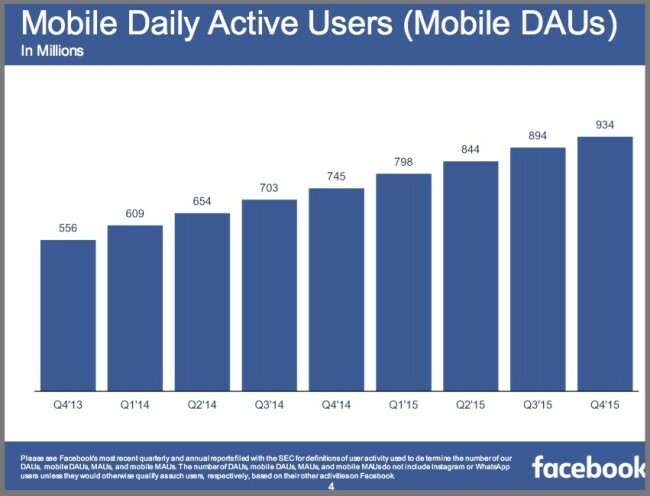 Daily active users (DAUs) were 1.04 billion on average for December 2015, up 17% year-over-year. Mobile daily active users (Mobile DAUs) were 934 million on average for December 2015, up 25% year-over-year. 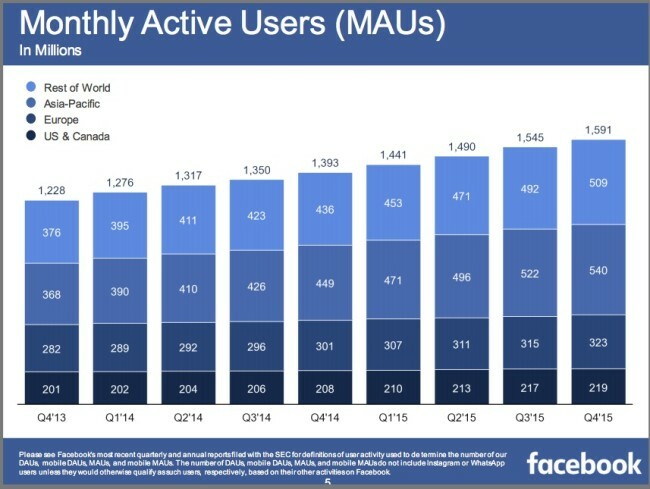 Monthly active users (MAUs) were 1.59 billion as of December 31, 2015, up 14% year-over-year. 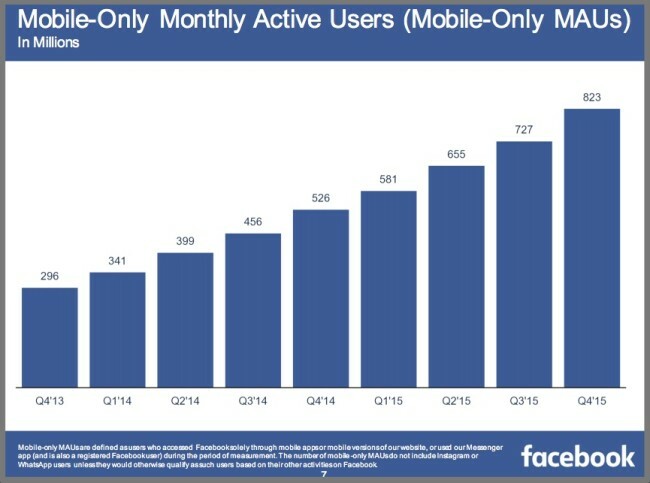 Mobile monthly active users (Mobile MAUs) were 1.44 billion as of December 31, 2015, up 21% year-over-year. 2016 is the year of contextual marketing. 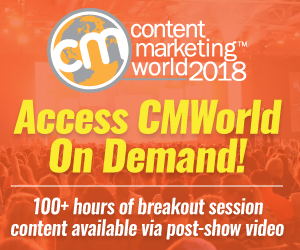 Where what, when, why and how your audience accesses and consumes your content to meet their immediate needs is key to entering and staying in the consideration set. Nowhere is this more clear than Facebook. Don’t take my word for it. Look at the numbers. People watched 100+ million hours of video on Facebook in 2015. 80 million people use Facebook Lite, a lower-bandwidth optimized service (mainly in developing area’s slower connections). This is up from 50 million 3Q2015. 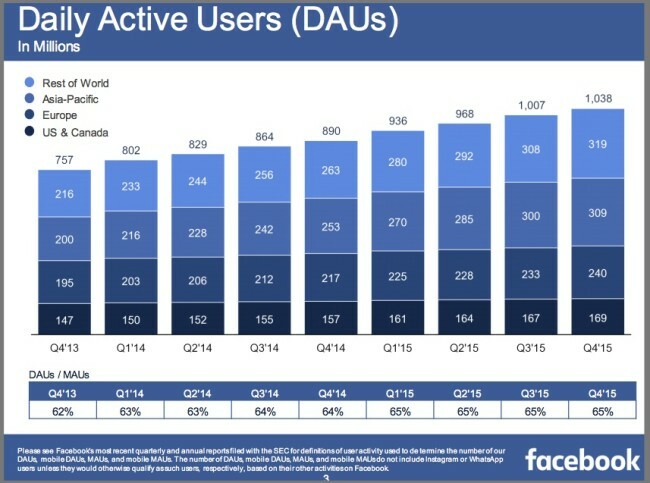 1 billion monthly users (MAUs) on Facebook Groups, up from 925 million at the 3Q2015. 500 million people use Facebook Events, up from 450 million in July 2015. 123 million events were created in 2015. Facebook has 2.5 million advertisers. While the 80%/20% rule probably applies to revenue generation, it’s still a lot of advertisers competing for member attention. 98% of top advertisers on Facebook also advertise on Instagram. 50 million small businesses had Facebook Pages up from 45 million in 3Q2015. 900 million MAU on WhatsApp. Facebook plans to rollout new ways to allow businesses to use it. 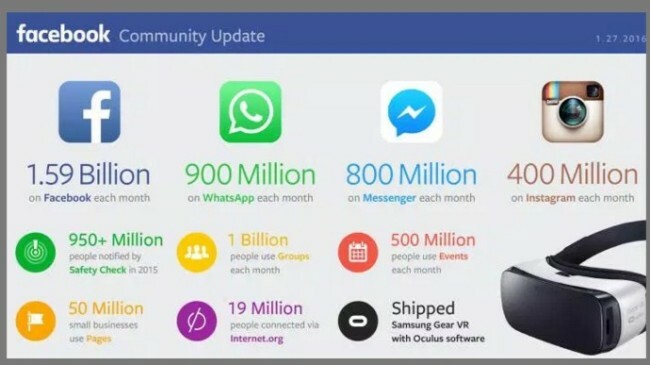 800 million MAU on Facebook Messenger. Facebook is a full-fledged media entity. Where other strong media entities have diversified, Facebook’s revenue stream is only focused on advertising. Unlike other media entities, namely LinkedIn, it’s not monetizing its subscriber base nor is it offering any standalone products. Given the strength of US and Canadian revenues, Facebook has to evolve and rebuild its relationships with younger and former US and Canadian members. While I haven’t seen statistically valid research, Facebook has lost its luster with millennials and post-millennials. No surprise. Who wants to socialize with grandma? That said, Facebook is skilled at evolving to meet current member needs in a dynamic environment through smart acquisitions and integration such as Instagram and WhatsApp. Facebook leveraged and grew Instagram into the new “IT” social media platform. By contrast, Yahoo’s acquisition of Flickr caused the earlier photo platform to languish. Flickr’s went from the photo darling to be to nowhere. In the early 2000s Flickr was where small firms built their photogenic presence. Now Instagram is the place where brands and people strut their stuff. A NYC trainer confided that she used Instagram, LinkedIn and Facebook to market her business. 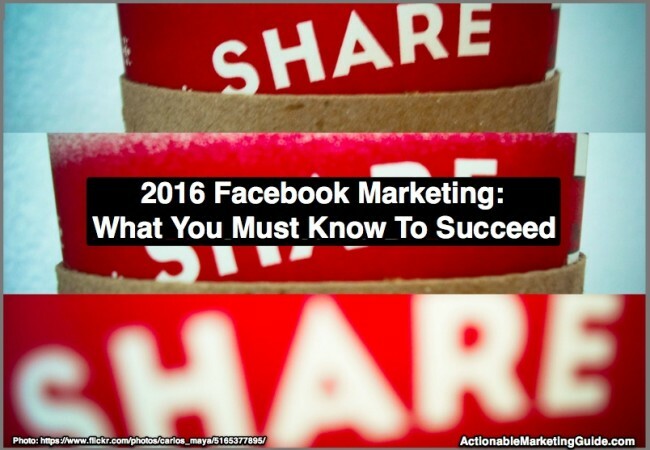 These 2016 Facebook marketing tactics are aligned with our 2016 marketing trends. They underscore that 2016 is the starting point for contextual marketing!!! This is no longer a nice-to-have. You need to be visible where your target audience spends their time. This includes B2B marketers. Don’t forget: You have to market P2P, person-to-person. Your target audience is composed of people. At its core, Facebook is a social media entity where you must be a person with a human face. This applies to all types of organizations: B2B, B2C, not-for-profit, solopreneur and media. Be active on a regular basis. Your goal is to become part of your target audience’s Inner Circle. Promote all of your content on Facebook following best practices. But don’t masquerade pushy promotions and ads as content. Curate links and share other people’s content. When you do so incorporate your branding and voice. Extend your relationships with key influencers. Think: Power of Other People’s Audiences! You want your brand and employee’s names to appear in their feeds. It’s the uberization of content applied to the Facebook stream. Pay-it-forward. Remember social media isn’t about you! It’s about your audience. For example, I received a major network press inquiry for a Los Angeles based social media influencer. Since I’m New York based, I recommended Rebekah Radice. When she got the slot, she shared the news on Facebook and thanked me. Tap into Facebook’s powerful mobile grip. Be visible when and where your audience is available. You probably can’t build this level of relationship on your own. 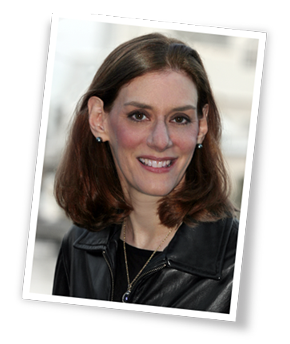 Expect Facebook to invest to strengthen its hold on your target audience’s attention. Pay for Facebook mobile advertising to enter the consideration set or risk being left behind. Facebook is spending to provide a viewer experience that keeps people on their site longer. Facebook is changing the video landscape with a dedicated video feed (shows videos viewers didn’t know about), related videos and picture in picture (think like a tv and music option. Together they keep viewers engaged. Think native social media advertising. With the ever-changing Facebook algorithm, you have to pay to play on this social media platform. Otherwise you’re invisible to your target audience. On the positive side, use your advertising budget to tap into Facebook’s mountain of micro-data about your customers. While many marketers complain they can’t track social media and content marketing results, measure your Facebook performance using their analytics. Include a call-to-action on your Facebook page and your Facebook advertising. Continually test your Facebook content and advertising to improve performance. Need Facebook help? Read Jon Loomer‘s blog. Facebook isn’t subtle. Being the 900 pound social media gorilla makes that impossible. As a marketer, you must be present. For your 2016 Facebook marketing, invest in people and budget. You need to actively engage with your target audience and support your 2016 Facebook marketing presence with advertising. Facebook COO Sheryl Sandberg expects Facebook will steal portions of advertising budgets from other platforms. Translation: Your 2016 Facebook marketing budget will increase at the expense of other media options. 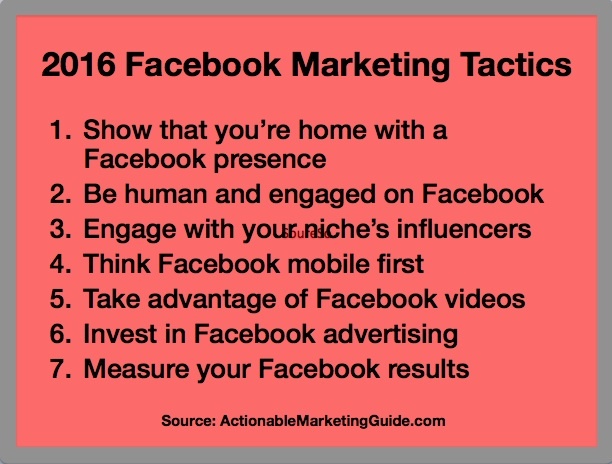 What’s your favorite 2016 Facebook marketing tactic? What do you base it on? 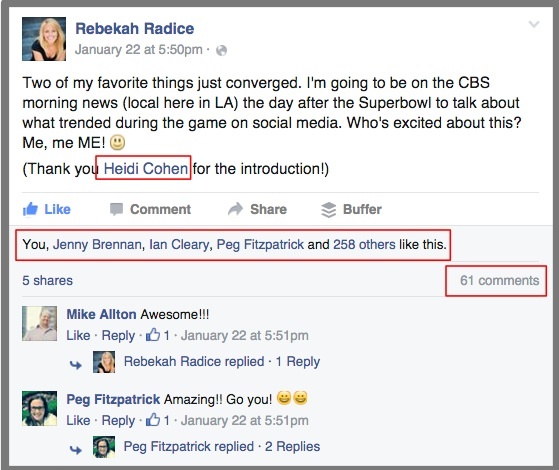 Tags contextual marketing, Facebook, Instagram, Jon Loomer, LinkedIn, Rebekah Radice, Sheryl Sandberg, WhatsApp. Bookmark the permalink. Great tips Heidi. Facebook engagement and being friendly to followers is very important. Share something viral and shareable rather than promoting your site.